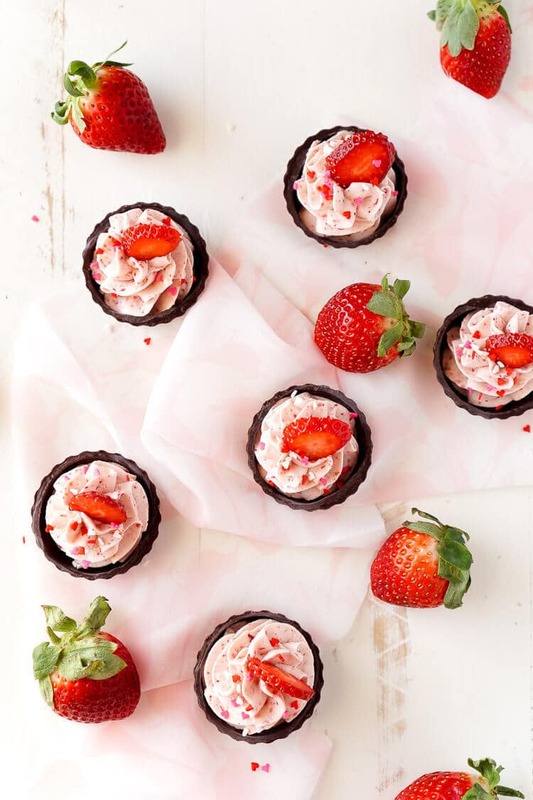 These Strawberry Mousse Cups are an easy dessert! A fluffy strawberry mousse is served in chocolate shells for a fun and simple Valentine’s Day treat! What’s this? It’s the first 2016 Valentine’s Day treat of the year! I’m way behind due to some failed recipes, a crazy workload, and some travel, but sometimes I think those things remind me that I just need to keep it simple sometimes. 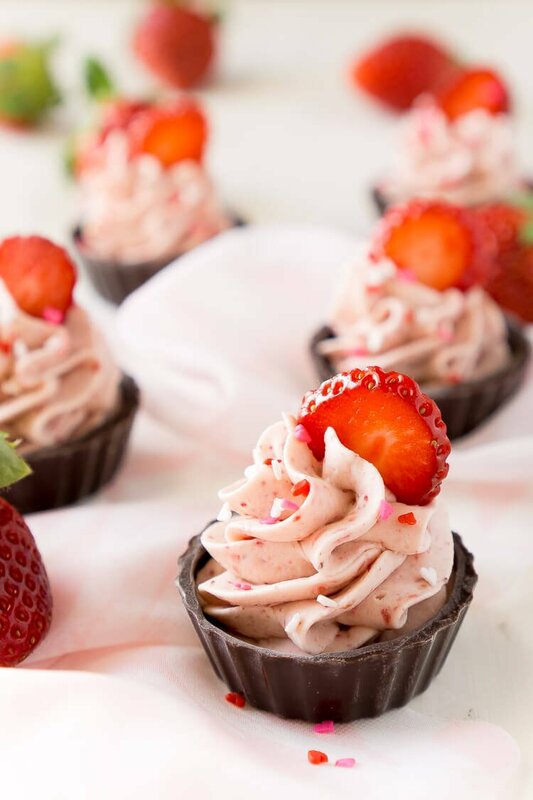 And these Strawberry Mousse Cups are just that: simple, sweet, and filled with strawberry awesomeness! 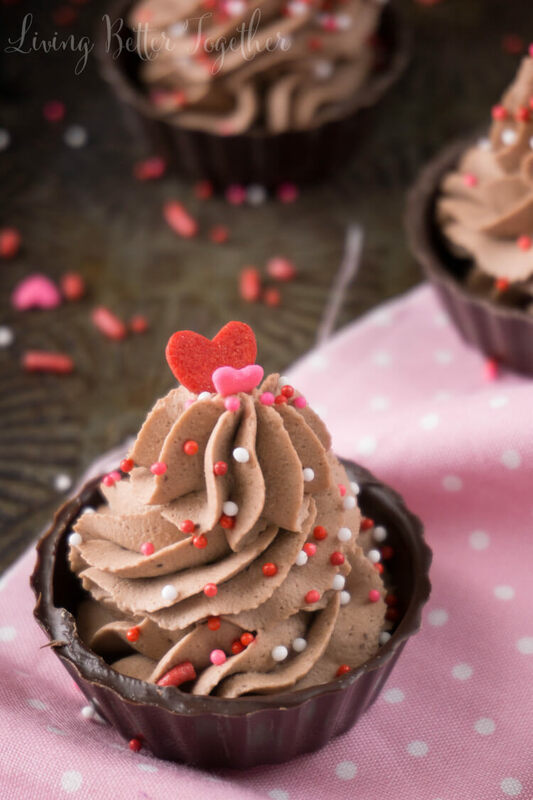 My 4-Ingredient Chocolate Mousse Cups have been pretty popular and I think you guys are really going to love these ones too! They come together really quickly and seriously, who doesn’t love a bite-sized dessert! These are great for kid’s school parties or even just to make at home and nibble on throughout the day since Valentine’s Day falls on a Sunday this year. 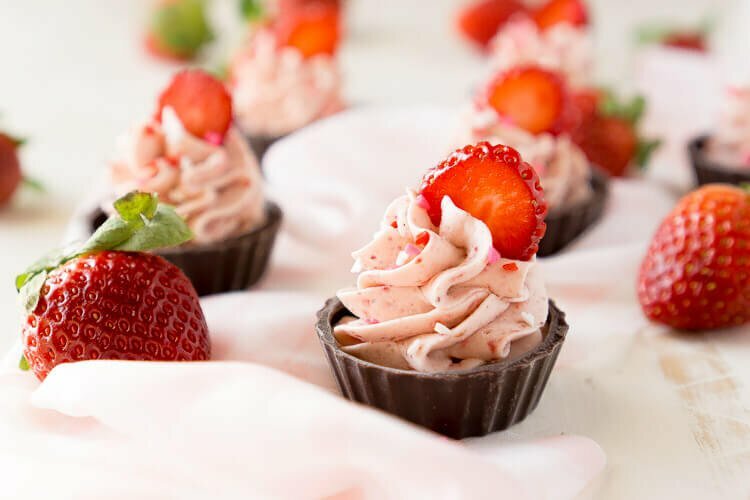 These mousse cups are great for serving up at baby and bridal showers too! 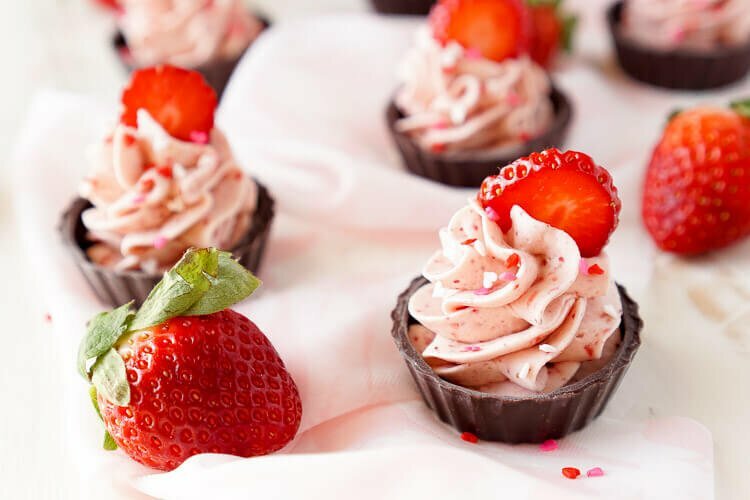 These Strawberry Mousse Cups are an easy dessert! 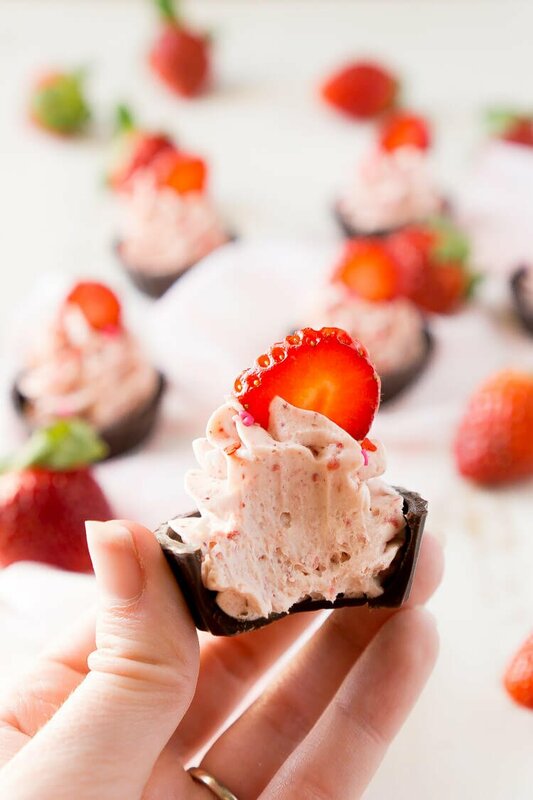 A fluffy strawberry mousse is served in chocolate shells for a fun and simple treat that's great for Valentine's Day, baby showers, bridal showers, or anything else! 9 Chocolate Cups I used ChocoMaker brand but you can make them at home with this recipe. Add freeze dried strawberries to a food processor and pulse until a fine dust forms. In a large bowl or stand mixer fitted with a whisk attachment, beat the heavy cream, confectioners' sugar, and pudding mix on medium-high for about 2 minutes. Add in the freeze dried strawberry powder and beat until light and fluffy. 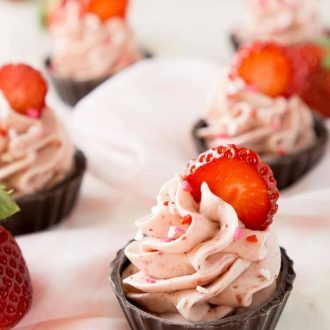 Pipe mousse into chocolate cups and garnish with a slice of strawberry and sprinkles if desired. Consume within a few hours. How long will these last in the refrigerator before serving? I’m needing to make them in advance, and I’m concerned the chocolate will start to melt a little. Will the chocolate version fare better in the refrigerator? Thanks! I’m planning to make lots of both flavors for a rehearsal dinner 🙂 ! THANKS! Are you using store bought chocolate cups or making your own? The store bought ones hold up pretty well. As for the mousse, they’re whipped cream based and are best served as soon after making as possible to maintain their fluffiness. If you have to store them with the cream, you definitely want to store them in the fridge, but the mousse can stiffen a bit. I would suggest making a test batch and running through it with a timeline similar to what you’re planning for the rehearsal dinner so you have an idea of how they’ll turn out. Let me know if you have anymore questions! I made these today. They were AMAZING!! I gave some to friends, and my family ate the remainder. They were easy to make and utterly delicious. I’m so glad you all enjoyed them, Carol! but that is lees than one ounce. Do you mean 6 ounces, and not 0.6? Hi Martin, 0.6 ounces is correct. I made these today for a baby shower. A big hit! People loved them! Trader Joe’s carries freeze-dried fruit, but they were out of strawberry, so I made raspberry. Still yummy! But I put a strawberry slice on top anyway. Also, if you want to purchase pre-made chocolate cups you better order because I could not find these anywhere. So I made my own the night before. I just used Wilton’s chocolate melts from Michael’s and painted it on mini cupcake liners with a little pastry paint brush. Chilled and touched up and chilled again before filling. I removed the liners before filling. Thanks for the recipe! The raspberry is another favorite of mine! 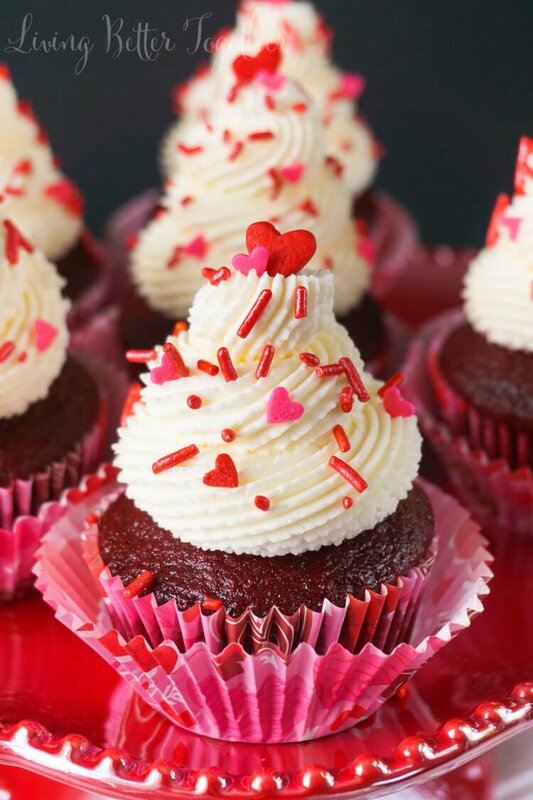 You should try my chocolate cupcakes with that raspberry as a frosting… so good! I’m so glad everyone enjoyed them and you were able to make your own cups! Where has anyone purchased the premade chocolate cups? Hi Vicki, I get them at Walmart, they’re in the baking aisle.